“007” style tours! This means: sophisticated, action-packed, professional and with all the frills. 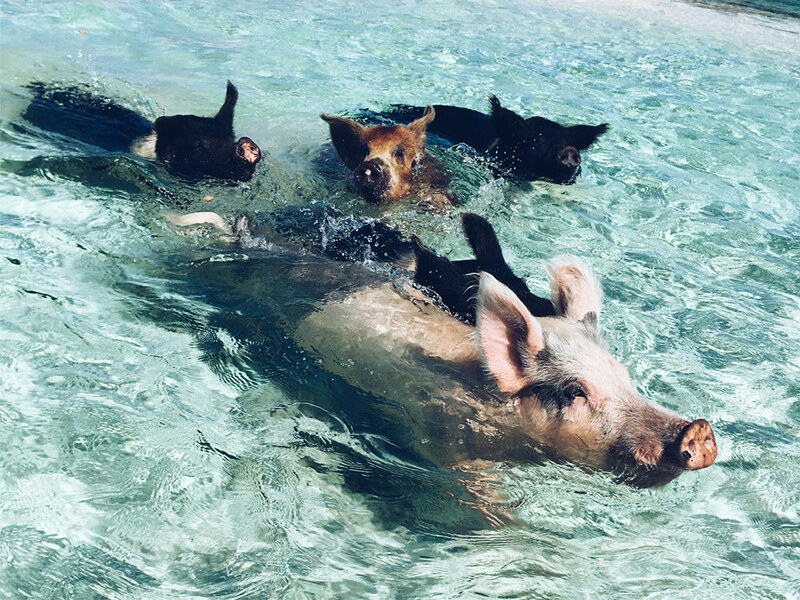 Take pictures with The Swimming Pigs, sunbathe on beautiful beaches, feed the iguanas, see wild sting rays, get an unforgettable ride on waverunners! Whether you want to join a public tour or do a private charter for your wedding, we will help plan an unforgettable trip that will exceed your expectations and more! Our most popular excursion! - Great for families and couples. (please note our requirements for very young children) A great introduction to the Exuma Cays. Swimming Pigs, Iguanas and beautiful beaches. Make your special day a lasting memory for all of your friends and family with a customized tour! Our beautiful 49ft powercat accommodates groups of up to 48. You can charter the boat for your family and friends. Book a full-day or half-day tour. Commercials, beach parties, weddings, photo shoots, we do it all. We are proud to be the #1 Tour in The Exumas! Pricing is up to 8 guests. Contact us for larger groups. Update your bucket list and book your tour right now!